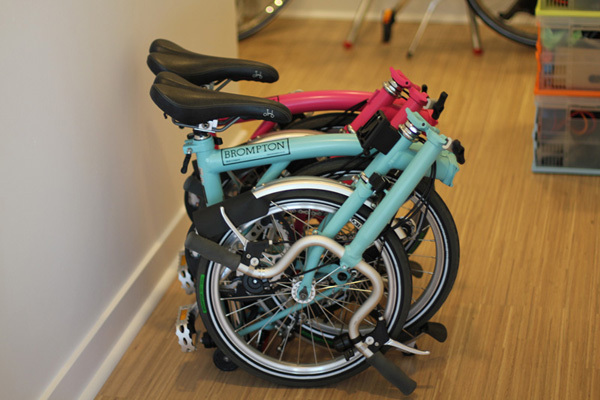 I would like to review our Brompton folding bikes because I think folding bikes can meet most bicyclist’s needs. Many people don’t consider purchasing folding bikes because they are small, awkward-looking, may have an uncomfortable ride, or can be perceived as expensive. Although my first bike was not a folding one, I can tell you after owning one that it is the most versatile and well-rounded bike that I own. I use it for almost everything except for very long distance rides. Folding bikes make commuting on transit and traveling much more convenient. In San Francisco, the MUNI light rail does not allow bikes at any time and BART only allows partial access. This is because a regular-sized bike usually takes the space of 2-4 people, so to make space for the greatest number of people bikes are not allowed. Also, carrying your bike on your shoulder, down the narrow escalator and through the turnstile to board the transit car is just too cumbersome. Elevators are crammed and slow and far too few. So, using a folding bike is a great way to bring your bike with you onto transit since you can fold it up and bring it on any transit line, even those that restrict full-sized bikes. Just make sure to fold it before you get on. When we traveled to Copenhagen, we planned on using their bike share system to get around and did not realize how difficult it would be for us to do so. Although it’s been called the bike capital of the world alongside Amsterdam, their bike share program City Bikes was not very good. I don’t fault them for that though because their bike share came out 18 years ago and every Dane already has his/her own bike so the system is old and there is little need to improve it very much. The Danish are very tall people and so all of their bike shares are for tall people. Nellie could not find a single bike share she could fit on, even when adjusting the seats all the way down. Also, the bike shares were very heavy with only one speed. They did not come with locks and the social agreement there seems to be if you see one laying around, just grab it even if someone is already using it and is just setting it aside for a second. My bike share was taken from me when I wasn’t looking twice. So then, we tried renting bikes from our hotel, and their bikes still didn’t fit Nellie either. We asked for a child’s bike but it was too small. Eventually, we did find a bike rental shop but we had already wasted so much time. We told ourselves that the next time we travel, we are going to bring our own bikes! Our criteria for folding bikes are that they have to be compact, light, and have the ride-ability of a full-sized bicycle. I want compactness so that they can fit through the airport scanner, light enough to carry them from check-in-counter to gate-check, and they have to have a comfortable ride. 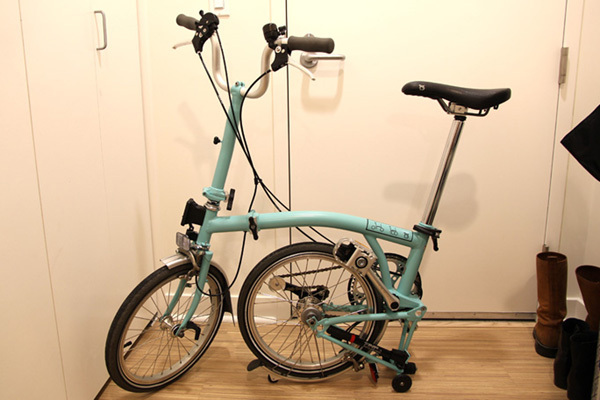 I read many positive testimonials about Brompton folding bikes. They have been handmade in London since 1981. They have received numerous awards such as Bike of the Year in 1996, Award for Innovation, and Bike Biz Brand of the Year in 2010. There was one blog, The Path Less Pedaled, where Russ and Laura reported on their tour around the country on Brompton folding bikes. I thought that if this couple could endure 5,000 miles (8046 km) on them, these folders must be downright awesome! So, when we went to Portland for another bicycling adventure, we paid a visit to Clever Cycles, an authorized dealership for Bromptons. We went there because they have a full array of Bromptons in stock, and Portland doesn’t have sales tax! 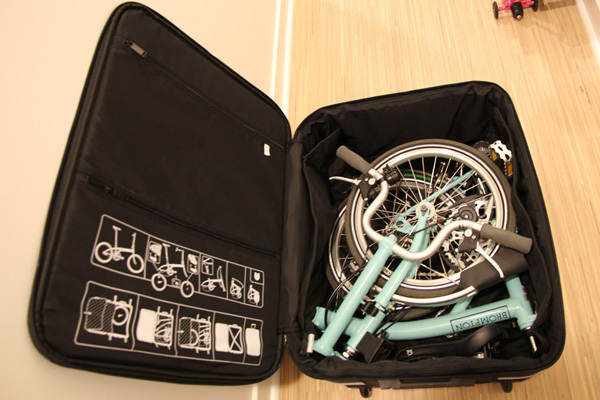 We bought both of our folding bikes from them with travel cases to boot. The great thing about Brompton folders are that they are pretty customizable to your specific needs. We decided to get the M Type handlebar for a more upright position, standard 3 speed version, fenders, EZ wheels and a front carrier block for mounting Brompton bags. Turkish green for me and hot pink for Nellie. The cost came out to be $1345 USD each. As the video demonstrates, the bike can be folded in less than 15 seconds. You don’t want a folder to be complicated when you’re in a hurry. Brompton stands up without the need for a kickstand or something to lean on. A small compact fold of 23″ x 21.5″ x 10.6″ (58.5 cm x 54.5 cm x 27 cm). Our first test for traveling with these bikes was when we brought them with us to Strasbourg, bike capital of France. We were not mistaken as to how convenient and enjoyable it would be for us! It was our favorite city to ride in. You got the beautiful parks and rivers all over the city, bistros and brasseries around every corner, charming pedestrian bridges and historical buildings to inspire your curiosity, and calm streets that make riding as enjoyable as it can be. Much of the exploring and getting lost requires frequent stops but these Bromptons made it simple. The wheelbase is similar to a full-sized bike which makes it as stable as riding a regular bike; but the small 16 in (40.6 cm) wheels brings the size of the bike smaller by 20 inches (50 cm) in length which makes it not intrusive to pedestrians on sidewalks, and the expended energy from having to stop and go is not noticeable. The frame being that low to the ground makes getting on and off the bike super easy. Furthermore, we didn’t experience bumpiness from such small wheels (maybe it’s the steel frame configuration that is dampening the bumpiness). 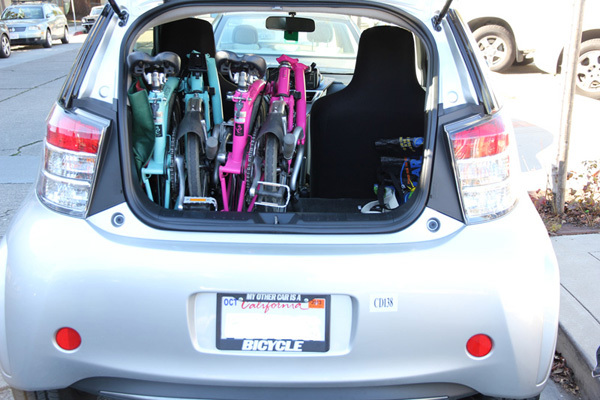 Small enough to fit into the Scion IQ’s small rear trunk space with rear seats folded down. In an old town like Strasbourg, the older hotels usually have small elevators. But at our hotel, with our folding bikes we were able to fit the two of us and our folding bikes just fine. 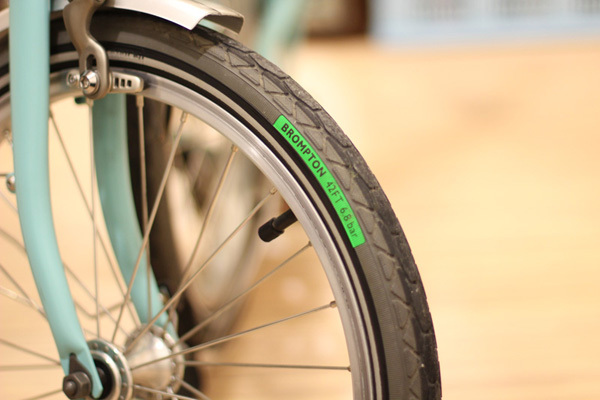 Standard tires that come with Kevlar belts to resist punctures and good treads to grip slippery road surfaces. 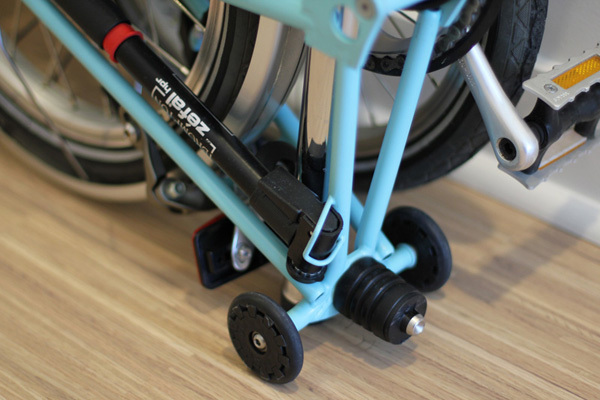 Zefal bike pump attached to frame comes standard and EZ wheels for rolling. Each bike comes with a Zefal bike pump which I find to be pretty decent. I am not a strong person but I am able to get enough air in the tires to be ride-able using it. I don’t recommend getting the EZ wheels because they are actually not so “EZ “to roll on. 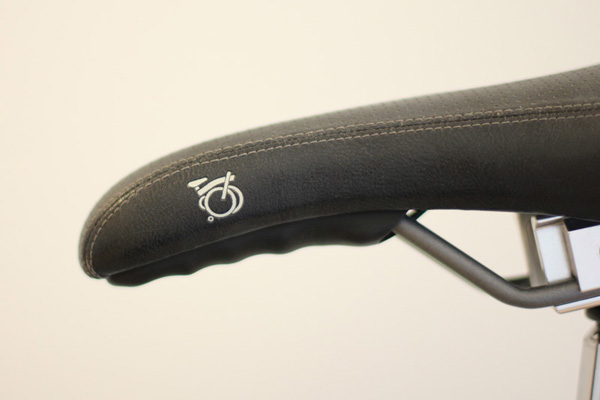 Grooves under standard saddle serves as a handgrip, a nice touch. The standard gear ratio is too high for us but you can request a lower gear ratio at no cost. Nellie and I rarely use the highest gear- it is actually kind of hard to pedal. You can always opt for 6 speed but that comes at an extra charge and additonal weight. The small front tire makes steering very sensitive but you will get used to it. Another issue I have is that although it weighs 26 lbs (11.8 kg), it gets heavy when you have to carry it over a long distance. Brompton fits perfectly in the Tern Airporter Mini. If you don’t like the hassle of getting your bike gate-checked at the airport (you will have to check with your airline if they allow folding bikes at gate check), you can get a luggage to transport it. I find the Tern Airporter Mini to be perfect. The Airporter has integrated TSA combination locks, two rolling wheels and a telescopic handle. It is of airline regulation size at 11.4 × 22.4 × 28 in (29 × 57 × 71 cm). The saddle from the bike has to be removed in order to fit. Not a big deal – just make sure to bring your tools to screw it back on. However, if you order a bike with a rear rack, it will not fit (update 10/23/16 – thanks to a reader – Nenad, the rear rack on a Brompton will fit). The combined weight of both folder and luggage at around 45 lbs (20 kg) is well within the 50 lbs (22.7 kg) limit. Price is $250 USD. We will be taking our folding bikes to Amsterdam on our next trip, and we will not bring the Airporters luggage. Since we are flying on KLM, a Dutch airline, hopefully they will understand and I have heard of people gate-checking their Bromptons without any problem. One person even brought their Brompton onto an airplane and stowed it in the overhead cabinet (Boeing 777 or larger). Overall, we love these durable, well-made, stylish, and adorable bikes and have no regrets about purchasing them. One last piece of advice: When ordering, the wait time is 6-9 weeks but expect at least 8 weeks. If you are planning a trip using them, make sure to order your bike way ahead in advance. I just got the book ‘Cycle Chic‘ from my wife, Nellie. She won it for me in a contest at this wonderful blog, Cycle Chic. To enter the contest, each entrant had to write a statement of why they think the person they are trying to win it for deserves the prizes of a book and CD (Bicycle: Nora and One Left). I love the Cycle Chic blog and I follow it religiously. So, it was a heart-warming gift when she won it for me. The book, like the blog, is by Mikael Colville-Anderson and has 288 pages and 368 colorful photographs with some fabulous quotes from famous people. One of my favorite quotes is, “Everytime I see an adult on a bicycle, I no longer despair for the future of the human race” – H.G. Wells. Most of the photos were taken in Copenhagen and show everyday people on their bicycles going about their business. Like the blog’s message, it accentuates the notion that cycling is for everybody and that you can look chic while riding. There are no photos of men in lycra, helmets and on road bikes. And that is exactly what we witnessed during our vacation in Copenhagen a year and a half ago. What I find interesting is that the photos really capture the people and their city’s vibe with such little text. It’s a great coffee table book or can be a nice gift to a person that you love. It was recently released and only comes in hardcover for now.